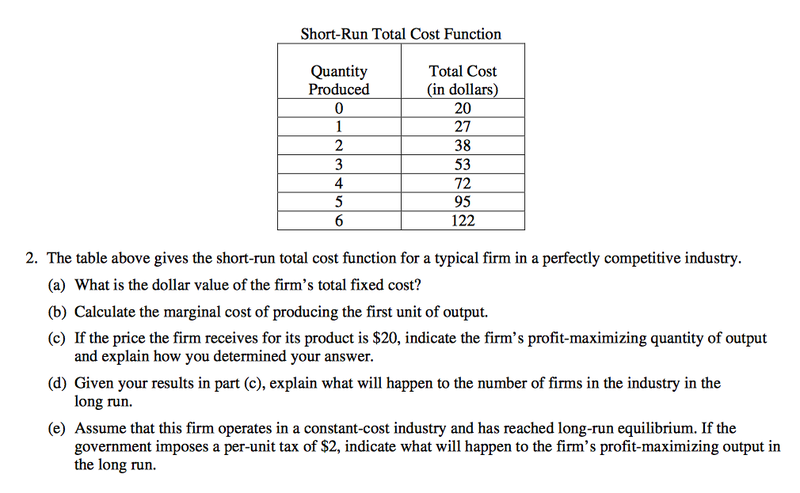 (a) What is the dollar value of the firm's total fixed cost? Understand that Total Cost = Variable Cost + Fixed Costs,,, Variable costs (think labor) only exist when there is actual production. If costs are ($20) and there is no production then the cost of $20 must be a fixed cost. (b) Calculate the marginal cost of producing the first unit of output. 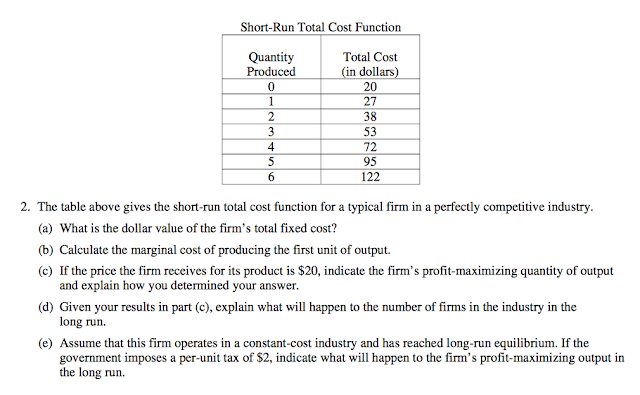 If Fixed Costs are ($20) and the Total Costs are ($27) then the Variable Costs/ Marginal Cost must be ($7). (c) If the price the firm receives for its product is $20, indicate the firms profit-maximising quantity of output and explain how you determined the answer. 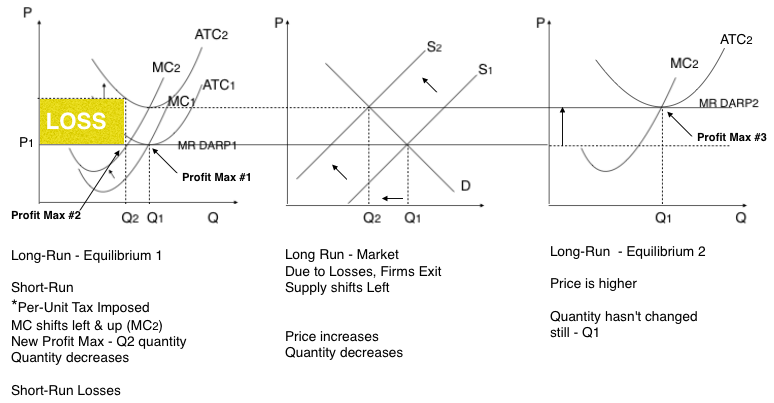 Marginal Revenue = Price,, as the perfectly competitive firm's (MR. DARP) is perfectly elastic. For every unit sold the revenue increases by $20 = the MR = P.
Profit Maximising quantity is where MR = MC, which is closest with the fourth unit. Understand that just saying the 4th unit does not explain,,, to explain you must clearly explain WHY? EXPLAIN - Using marginal analysis we compare where a firm's MR = MC, this is where profit is maximised. The 4th unit of production the MR $20 > MC $19. We are as close to Profit Max as possible, if we produce the 5th unit MR $20 < MC $23 (a loss). The firm profit max is to produce a quantity of 4. (d) Given your results in part (c), Explain what will happen to the number of firms in the industry in the long-run. Understand that the firm is making a profit of $8 with a production of 4 units. This is positive/abnormal/super economic profit in the short-run. Profits attract firms and therefore firms will enter the market hunting for profits. (e) Assume that this firms operates in a constant cost industry (clue), and has reached long-run equilibrium. If the government imposes a per-unit tax of $2, indicate what will happen to the firm's profit maximising output in the long-run. If in the Long-run firms are making zero economic profit, and the government imposes a $2 tax, it is fair to assume that the marginal costs will shift to the left as input costs increase.